Amber Jewelry Information and Advice. Learn from Amber experts. Amber Bracelet - fashionable and health smart! Rewarding yourself with a precious piece of Amber Jewelry sets you apart. Unlike traditional gem stones, every single Amber Bead is unique, just as you are unique. From ancient times, Baltic Amber has touched many lives and many cultures leaving its mark of extraordinary beauty and healing. In fact, it has long been cherished as a valuable charm that protects the wearer from evil while bringing healing and inner peace. Whether you are just looking at Amber Jewelry for the very first time or you are someone who understands the value of fine things, we have dedicated our website to ensuring your experience in exploring natural Baltic Amber is the very best. Because we truly appreciate the beauty, mystery and culture that surround amber, we can convey this to our audience exceptionally well. So what is Amber, really? Baltic Amber (succinite) is a tree resin that fossilized over 45 million years ago in the earth, it remains in the fossil stage, i.e. is subject to oxidising and polimerisation. Since this process is ongoing, Baltic Amber keeps changing so we can assume that it is a “living” stone. Amber has been used in jewelry, medicine, and perfumery since ancient times. Amber is the only fossil resin to contain 3-8 % Amber Acid, a medicinal substance with diverse effects. Amber is a very soft, its density is comparable to that of seawater and ranges from 0.96 to 1.096 g/cm 3. This is a key practical benefit, because it means that large Amber Jewelry can be easily made and comfortably worn. Raw Amber comes in diverse forms drops, icicles, dripstones and nuggets of various sizes, which show how it was formed and how it travelled. Where Does Baltic Amber Come From? The largest deposits of Amber are found in the Baltic Region. These deposits represent approximately 80% of the world’s known Amber. The prices can vary depending upon the clarity, color, polish and the size of the nugget. Some collectors also place a higher value on pieces that have Inclusions inside Amber. The most valuable Color of Amber is rich yellow. 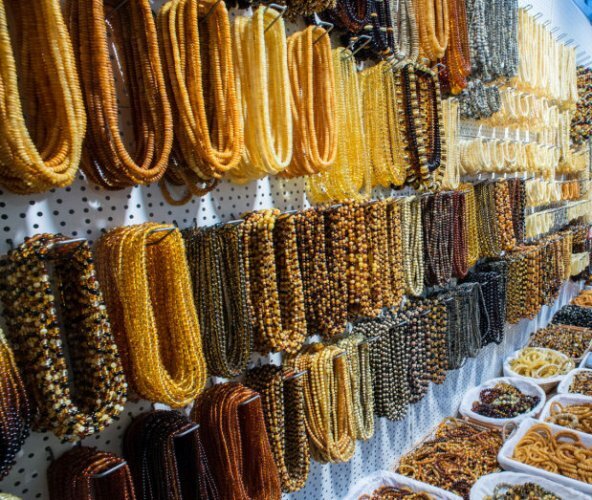 To give you a better idea about prices, for instance, Perfectly Round Baltic Amber Butterscotch Beads command high prices. For instance, 10-15 mm natural Baltic Amber Beads in diameter are approx. $13-15 per gram. Smaller beads cost a bit less and larger ones more. Clear Amber is more valuable than pieces that look cloudy or opaque. Clear Amber showcases the gem's radiant warm colors, and Amber that contains ancient plant or animal matter is more valuable when those inclusions are readily visible. Baltic Amber is unique among gems for its ability to contain other once-living things within it. Amber often contains organic inclusions: insects, arachnids, myriapods, small amphibians, plant remains, grains of sand and gas bubbles. They are a source of information about the time when Amber was formed, the animals which lived in the proximity of resinous trees or were active when the resin flowed out. Natural Amber and pressed Amber contain nothing but fossilized resins. However, natural Amber has undergone less processing to turn it into a gem-quality stone. If the gem has been shaped, polished, and treated from a single piece of Amber, it is considered natural Amber. Pressed amber is made from smaller Amber pieces compressed and heated to form larger or better shaped gem. Handcrafted by incredibly talented Lithuanian amber artisans who employ timeless methods in creating each of our unique Amber Jewelry designs, our Baltic Amber Jewelry is both traditional as well as cosmopolitan. Whether you are searching for a very simple, beautifully made Amber Necklace or Amber Bracelet in a solid color or a “statement” piece comprised of large gems, you will find many options to choose from at Amber Artisans. Feel free to browse and enjoy all the information we have provided to make this a wonderful experience for you. Learn more how to choose and Buy Amber Jewelry Online. So welcome, and thanks for visiting us. If you have any questions or suggestions, we would love to hear from you, so please contact us.